GENEVA, Switzerland – German brand Audi chose the Geneva Auto Show as a backdrop for the world premiere of the eight-generation A6 sedan. After the A8 and the A7, it’s the A6’s turn to be completely redesigned and get an injection of technologies developed by the automaker from Ingolstadt. This overhaul allows the A6 to adopt a look that’s both more refined and more aerodynamic, as evidenced by the car’s drag coefficient of 0.24 as well as its balanced proportions. The hexagonal Singleframe grille is large and low, the headlight clusters are slimmer and the front air intakes are bigger, all elements that contribute to its sportier look. At the rear, we notice a large chrome strip that highlights the car’s width and joins the taillights together. The trunk’s volume remains rated at 530 litres, but the new opening makes loading gear easier and the trunklid can be opened by simply swiping a foot below the bumper. the new 2019 Audi A6 is longer and larger than the outgoing generation, while its wheelbase has been stretched to provide more passenger room. The biggest transformation is technological, with two high-definition, colour touchscreens—with acoustic and haptic feedback—that serves as interfaces for the car’s various systems. Just like in the A8 and the A7. The upper screen, which measures 10.1 inches, controls the navigation, infotainment and communication functions, while the lower 8.6-inch screen is used to set the climate control system as well as the heated and ventilated seats. It can also serve as a digital tablet for entering an address in the navigation system or a phone number. The Audi virtual cockpit, which replaces the classic analog gauges in the driver instrument panel, is also included. Like the A8 and A7, the new A6 receives all the necessary equipment for level 3 autonomous driving. That means the car can drive completely by itself when it’s travelling at less than 60 km/h on the highway, after the system is activated by the driver. Level 3 autonomous driving is only allowed in certain areas for the time being, but we’re expecting many countries to change their legislations in order to permit self-driving technology. The new Audi models—A8, A7 and new A6—are already ready for this eventuality. Several powertrains are offered according to various markets, including one gasoline and three diesel engines, but we’re expecting that A6s sold in Canada will all get one: a turbocharged 3.0-litre V6 that develops 340 horsepower and 368 pound-feet of torque, which can also be found in the A7 as well as in one of the A8 variants available on our market. This V6 engine is matched to a 48-volt electrical system and mild hybrid technology with the use of a belt-driven alternator (BAS) and a 10-Ah lithium-ion battery. This powertrain reduces fuel consumption, since the car can freewheel with the gasoline shut off between 55 and 160 km/h, for up to 55 seconds at a time, before the engine restarts in utter smoothness. The A6 is also equipped with an advanced automatic start/stop system as well as an energy recuperation system of up to 12 kW. The quattro all-wheel drivetrain is fitted as standard with the V6 engine and the transmission is a seven-speed, dual-clutch automatic, just like in the A7. The 2019 Audi A6 offers four types of suspensions: one with conventional steel springs, a sport suspension, a guided suspension as well as an air suspension with controlled damping. We don’t yet know which ones will be offered on the Canadian market. Also available on the options list is a four-wheel steering system that rotates the rear wheels by five degrees in the opposite direction as the front ones during low-speed manoeuvres, making the A6 more agile, and in the same direction as the front wheels at speeds above 60 km/h, making the car more stable during highway lane changes or during quick lateral transitions. 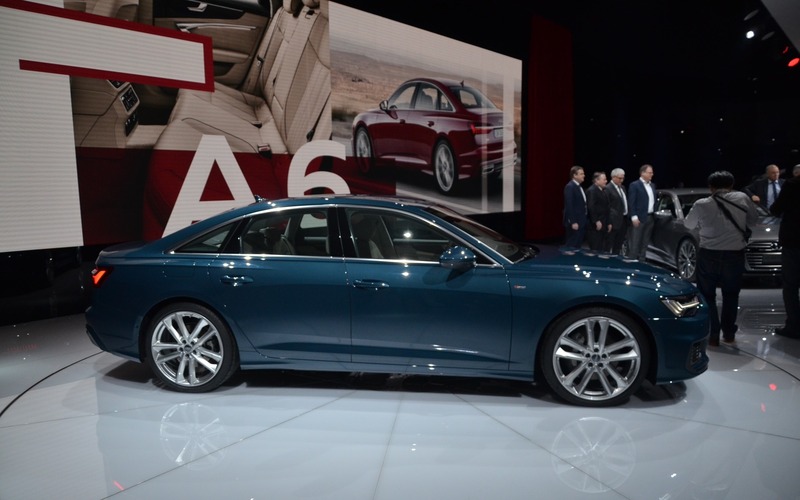 The new, eight-generation A6 will go on sale in Europe this summer, and should hit the Canadian market at the end of 2018.